Just when you thought your SEO strategy was in place, Google changes the rules again. The new algorithm, nicknamed “Hummingbird,” is expected to impact 90 percent of the search engine traffic in 2014. Of course, we all know Google doesn’t reveal details on its algorithm but one thing Hummingbird does reinforce is the importance of content. You can now argue content is more important under Hummingbird than under its previous algorithms – Panda and Penguin. So why the change? Google has trained consumers to ask questions when searching for results, so it was only natural that the latest search evolution would place a higher emphasis on how your content answers questions. Unlike the past, where keywords were used to find topics with search engines, Google now places a higher emphasis on content that delivers valuable information. What does Hummingbird mean for your SEO marketing strategy? It means if you are creating content for your company blog, you should pose questions in your copy, followed by the answer. Or even better yet, ask the question with an H2 tag and answer the question in the next sentence (like the last paragraph did). Here is an example of how this new strategy can help your SEO better promote your content. If you own a business, you know the importance of ROI and PR. But what is the ROI of public relations? If you type in that question on Google, the first result you will see is an article that promotes a white paper on “How to measure the ROI of PR” written by MaciasPR. Under the new Hummingbird SEO, your future content should be asking questions, like in that example. While in the past, ROI and PR, may have led to a decent search ranking, Google is now taking a closer look at content and determining which content is answering the questions. There is another important item that the new Hummingbird reveals. Content is King on the web and if you’re not creating new content, your business is at a strong disadvantage when it comes to search engines. Yes, your business can pull out ads and market itself on Facebook, but when those ads are done, you will lose your exposure. However, if you create solid content in your industry and answer key questions for your customer base, the overall ROI of that content will be much better than a pure ad play. Did you know that PR can also improve your SEO? Click here to read an article on how PR can improve your search ranking. Want to get publicity for your business? Click here to get a free copy of our white paper that reveals tactics and strategies for any business. If you are in need of publicity, MaciasPR.com can help. We’ve gotten our clients media placements with the New York Times, Good Morning America, CNN, Fox News and others. The owner, Mark Macias, is a former Executive Producer with WNBC and author of the book, Beat the Press: Your Guide to Managing the Media. You can learn more about our media strategy at MaciasPR.com. 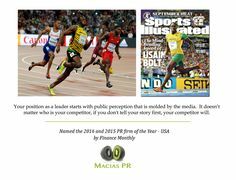 If you are in need of PR Help or media advice, MaciasPR can help. We run our PR agency differently than others and our results speak for themselves. We’ve gotten our clients high-profile media placements in the New York Times, Good Morning America, Inside Edition, the New York Post, CNN, Fox News and others.